This is a spin on the classic recipe for French steamed mussels—you know, the big bowl of mussels bathed in white wine, butter, and garlic. This dish exudes a certain exoticness and it works for a casual dinner party. It's both easy and quick, but like all such recipes, the quality of the ingredients matters a lot. 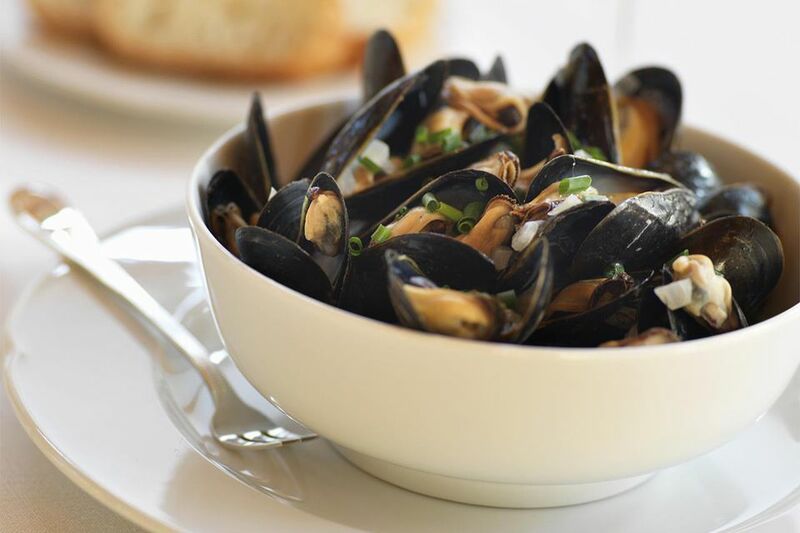 Buy the best mussels and good, sweet butter and use a white wine you'd drink yourself. Figure on 1 pound of mussels per person for the main course. In case you are wondering, a mussel is alive if it reacts. Its shell should be closed. If it is open, set the mussel on the kitchen counter for a bit. It may close when you are not looking. If it doesn't open, discard it. Heat the butter over medium-high heat in a large, wide-bottomed pot with a lid like a Dutch oven. Sauté the green onions or onion until soft but not browned. Add the garlic cloves if you are using them; if you are using the green garlic shoots, leave them out for now. Add the white wine—like a Chenin Blanc or something crisp but any decent white wine will work—and bring it to a boil. Add the mussels in one layer if possible. Cover the pot and let the mussels steam for 3 to 8 minutes. After 3 minutes, check the mussels; many should be open. You want them all open, but some will do this faster than others. As soon as most of the mussels are open, turn off the heat and toss in the green garlic if that's your garlic choice. If you want a little more heat, add optional crushed red pepper flakes, as desired. Cover for a minute while you prepare bowls and plates. Serve with crusty bread, more white wine (a good choice is the one you used to cook with) and don't forget an extra bowl for the shells.